The Environmental Finance Center at the University of North Carolina at Chapel Hill conducts surveys of water and sewer rates in many states across the country and turns those results into rates dashboards. In recent years, at least three news outlets in Arizona, Illinois, and North Carolina have used data from these surveys in their stories showing that neighboring water systems often charge vastly different amounts for the same quantity of water. In the Arizona story, News 4 Tucson interviews a local resident who doesn’t understand why he pays more for water at his system than he would if he were a customer at neighboring systems. Is he right? When it comes to price, is it true that water is water? Absolutely not. Many customers incorrectly believe that the cost of providing a gallon of water is the same regardless of which water system provides it. In reality, there are many factors that can influence the price of water and cause water rates to vary, sometimes significantly, even among neighboring systems. Ideally, water rates reflect the full cost of providing water service today and into the future. That includes covering the full suite of operating and maintenance costs such as salaries, taxes, insurance, utilities, chemicals, lab fees, contracted services, repairs, and depreciation. The full cost also includes debt service payments, capital improvements, and contributions to reserve funds. The full cost of providing water service today and into the future is unique to each system. There is not a standard, per-gallon price across the country. Furthermore, not every water system collects the full cost of providing service through its rates and fees. Both of these factors cause variations in water rates among systems. For a more in-depth look at the full cost of providing water, watch this short clip on full cost pricing. 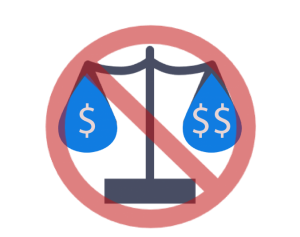 There are several factors that make the full cost vary for water systems. Salaries are often one of the largest (if not the largest) operating costs for water systems. Alternatively, some small community water systems, particularly non-governmental systems like homeowners associations or condo associations, rely on volunteers to operate and manage the system and may not have any paid employees. Even if similarly sized systems have the same number of paid staff, the salaries and benefits paid to those employees are unique to each system and change over time at different rates. In addition, some water systems cover part of the salaries of board members, town managers, budget officials, or other general government employees, whilst other systems do not. The cost of water treatment can also vary significantly from system to system. The amount of and type of treatment necessary can have a significant impact on treatment cost—a mix unique to each water system. In general, treating surface water is more expensive than treating groundwater. The presence of arsenic or other contaminants can drive up treatment cost. Removing salt from source water through reverse osmosis, for example, can also add to cost. Even adjacent systems can have vastly different levels of source water quality. The quality to which the water is treated also impacts costs. All systems, at a minimum, have to meet the requirements of their permits and the Safe Drinking Water Act. But some systems choose to treat water to a higher standard to have improved taste, odor, and/or color. The system may set goals for the pressure that water comes out of taps or how quickly they respond to customer complaints. The higher the level of service, in general, the higher the cost to the system. The cost of water distribution also varies significantly from system to system as well, particularly the cost of energy. Some systems are able to deliver water to customers primarily through gravity, while others must pump water across large areas or over hilly terrain. Even if two systems have similar energy needs, they may be using pumps with different levels of efficiency, which can impact energy consumption. Some systems pay time-of-use energy rates or demand charges, which can make a unit of energy more expensive depending on when it is consumed. Different systems may not all be on the same rate structure with a single electric provider, and even neighboring systems could be paying different rates for electricity if they are on different energy providers. Non-revenue water can also contribute to higher system costs. Not every gallon of water that enters the distribution system ends up being charged to a customer. All water systems experience some level of non-revenue water. Some water is lost through leaks. Some water reaches customers but is not billed properly due to malfunctioning meters. Some systems authorize water consumption for certain users that is not billed, perhaps for the fire department or for the local school. And water theft can also be an issue. Some of that non-revenue water—especially leaks—may be due to the overall condition of the system’s assets. Systems in worse condition may necessitate more repairs, which can lead to higher costs. And deteriorating assets will eventually need to be replaced, which leads to increases in capital spending and/or debt service. These and many other factors can impact the total cost for the water system itself. But how much each individual customer of that system has to pay also depends on the total number of customers and the balance between residential and non-residential customers. Having fewer total customers does not automatically mean lower total costs. In general, economies of scale exist within the water sector. The total annual cost of a system serving 500 people may not be significantly more than the total cost of a system serving 200, but the smaller system has far fewer accounts over which to spread the cost. Even if all the above factors were equal, it still does not mean customers at neighboring systems would pay the same bill for the same level of usage because how water systems structure their rates is unique to each system. Water rates are structured as a balance between the base charge and the volumetric charge. Systems that have volumetric charges can structure them differently (uniform rates, increasing or decreasing block rates, seasonal rates, etc.). Rates may vary based on customer class. The base charge may vary based on the meter size. Even if two water systems needed exactly the same amount of revenue, there are dozens of different rate structures that could get them that figure, so two customers using the same amount of water usage could be paying drastically different total bills. And depending on whether the system is governmental, non-profit, or for-profit, it may need its rates approved by a utility or public service commission, which can add significantly to the system’s total costs. Because of all these factors, customers should not expect a gallon of water to cost the same regardless of the water system delivering it. What other factors can impact the cost of producing or delivering water? Or a customer’s bill? Please leave them in the comments. It was well worth the effort of working with the EFC Network to get to this point and help us get closer to financial sustainability. The EFCN helped us balance our concern about our customers’ ability to pay with our water system’s need to be financially stable.